Successful scouting takes more than just having the best trail camera in the world. You could set up the most expensive and the highest-grade camera in the world and yet, it could capture a single deer on film. But, do not lose hope as there is still a great chance for you to move the luck towards you. You need to exert some extra effort though to make sure that you successfully take photos. 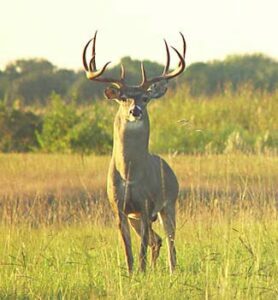 A deer usually requires 2 to 3 quarts of water a day, even more during hot summer days. It is then logical that you locate the water sources as well as the trail leading to those areas. This is because these will be the most likely places where they will hang out. You can increase your chances if you hang your camera in these areas. This does not mean, though, that you will place your trail camera in every area where there is water. Find those places that are sheltered and covered, somewhere that a deer will be safe from predators. These areas must have plenty of vegetation and will most likely have numerous tracks. Finding an area with these features will help you successfully take a shot of a deer. A deer funnel is a path that is created by a deer that travels the same route over and over again. It is quite simple to create one as a deer is very predictable with the path it takes. It does not take the most direct route. Rather, it travels the easiest one. Find a path with this characteristic and create the funnel to direct the deer towards that path. This will be an ideal choice to set up your camera. The good thing about this is that a deer will most likely use the safe trail you created year after year. Their habits are pretty much predictable which is why you can easily guess where they will be heading every year. You may have to set up your camera ahead of the hunting season, though, to give time for your scent to be gone or else you will just put your effort to waste if they scatter away. Before you create the funnel, you also have to make sure that there is no existing one nearby. It will be likely between the bedding area and the source. You need to block this funnel to divert the deer to the one you created. You could create a small path within thick vegetation as this is where a deer tends to pass through. Another one of the predictable patterns of a deer is its travelling time. Typically, a deer leaves during the morning to find food and returns at night. Similar with finding the water sources, locating the areas where they sleep, eat and drink and you will have great chances of capturing regular travellers. The first thing that you need to do is find their bedding area or the area where they sleep. This area will need to have a thick vegetation or dense cover like tall grasses, thickets, and other foliage that serve as protection. You will know if you are on the right track when you see a matted down area that is full of droppings. For finding the feeding ground, there are many ways to locate it. One of them is locating an area with a concentrated amount of crops or grasses. Another is finding a place where acorns and beechnuts fall. 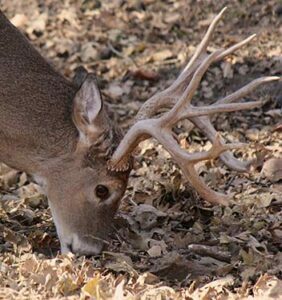 Check out areas with these features and you will be sure to find the feeding ground. As with the water source, you also need to set up the camera during off season or early in the season to wash away your scent in time for their hunting. This is the time where they limit their movement and tend to stay in just one place. This plan requires a longer time and more effort compared to the others ways mentioned. However, this is a highly effective one especially if you hunt in an area with dense vegetation. It is quite simple as you only need to grow a clover. Before you start creating a food plot, you do need to carefully plan first. If you have a plotwatcher camera (check out my Plotwatcher Pro review), it will be best if you place them before any deer arrives so they will not be scared by it anymore. It will seem like a part of the landscape. You will also have to determine the bedding area of the deer. Once you find it you, you can create the food plot nearby. Set up your trail camera within the area or along the path towards it. By following these steps, you will be able to increase your chances of capturing the deer on film. You do not need to entirely give up your old scouting ways though. You can just add these tips to your usual ones. With this, you will be able to reduce the number of days of your stay in the wild. If you aren’t familiar with game cameras, you can check out my trail camera reviews for the down-low on selecting the right one.